Four million laparotomies are performed annually in the United States with a 3–20% hernia occurrence rate. 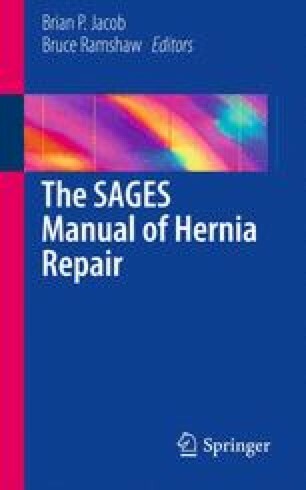 The use of mesh for ventral hernia repair has drastically reduced hernia recurrence rates to less than 10% in a majority of studies. Because of this, the focus on hernia recurrence has shifted to concerns over pain and quality of life. Pain after ventral hernia repair should be divided into immediate postoperative surgical pain and more long-term neuropathic pain. Chronic pain is defined as pain lasting >3 months. Evidence reveals that chronic pain is most likely multifactorial with an incidence ranging from 1 to 7%. Major factors that have been identified as possible etiologies include transfascial fixation devices, mesh type, as well as surgical approach. Preoperative pain seems to have the strongest correlation with postoperative pain in our experience. Evaluation of pain and quality of life postoperatively can be complex, with the visual analog scale being the most widely used model. More recently, the Carolinas Comfort Scale™ has demonstrated improved sensitivity and specificity over other, more generic measures. Initial nonoperative management of chronic pain with oral analgesics and anti-inflammatory medications is the most conservative approach, but local injection of anesthetic and even mesh excision may be required. Prevention is the best approach, with a prevailing hypothesis that the use of a lightweight mesh with appropriate tension limits the risk of postoperative pain, but to date, no technique has been found to fully eliminate this problem.